Sodium and health is the topic of this page, and in it I will attempt to dispel some misconceptions about it, among them the relationship between salt and hypertension (high blood pressure). I will also talk about potassium imbalance, the problems that it can cause, and how it is related to salt intake. The point is to get you to make better choices regarding the amount of salt you use and also the quality and source of it such as replacing ordinary salt with sea salts. Salt and sodium as terms are often used interchangeably but they are NOT the same. Sodium chloride is table salt to which iodine is sometimes added. It is a form of sodium, but not the only form. 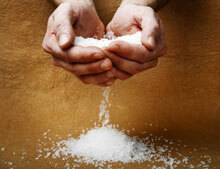 Salt exists in various forms and has been used all throughout human history. It has been valued as a preservative, a food condiment, and has even been used as currency at times. Through much of human history, sodium and health went hand in hand. At some point salt and hypertension were linked largely due to faulty research on the relationship and effects of salt on the human body. While sodium has a role in regulating blood volume, this does not mean that it is the cause of hypertension. To date there is no scientific evidence that moderate intake of salt causes hypertension! Potassium is vital to life. Without it, muscles cannot function properly. It is essential to the function of the vagus nerve, which controls your heartbeat. Sufficient sodium needs to be present to allow potassium to do its job! The potassium is transported across the cell membrane by sodium and thus salt and potassium in their proper amounts are necessary for muscle contraction. Salt is also responsible for maintaining proper blood volume, another critical aspect of health. Maintaining proper potassium level is certainly important, but having proper sodium levels is just as important for a healthy electrolyte balance, which in turn ensures that critical muscle function is maintained. Ok, so now we understand that sodium and health go hand in hand, and that the link between salt and hypertension has likely been overstated, but is there an unsafe level? This depends upon the activity level of the person in questions. Research indicates that athletes need approximately 2 grams of sodium for every liter of water consumed. It is unlikely that you would consume a toxic amount of salt if you stick to unprocessed foods, and use sea salt on your food! For ordinary individuals the RDA is set at 500 milligrams per day, but this is questionable as the formulas used to determine RDA levels has since been called into question as being inadequate. The RDA for potassium is 3,500 milligrams. Since it requires three molecules of sodium to transport one molecule of potassium into a cell, the RDA figure of 500 milligrams for sodium would seem to be far to low, especially in conditions of intense exercise and sweating, and could lead to a potassium imbalance due to a lack of sodium! It would appear this figure should be higher for athletes, and also for the average healthy individual. A good rule of thumb in terms of sodium and health, would be to consume foods in the form of fresh fruits, vegetables, and lean proteins, and avoid sodium laden processed foods. Get your required sodium from natural raw foods, and supplement it by seasoning your food with high quality unprocessed sea salt. This salt should not be white, but rather gray, or pink, which indicates that it contains vital minerals in addition to sodium. Steer clear of ordinary processed table salt, “salt substitutes” and especially substances like monosodium glutamate, which is a mild neurotoxin. This is much more dangerous than consuming sodium, and should be avoided by all persons who care about their health! In regard to the link between salt and hypertension, unless you have a specific health condition in which sodium needs to be restricted, there is little cause for concern that sodium intake from healthy sources, including unrefined sea salt will cause any negative effects on your health. Remember that sodium and health are not incompatible; they go hand in hand, provided that you get your needed sodium from the right sources, and prevent potassium imbalance, thereby ensuring good health and proper function of your body.